iDepartment of Biomedical Imaging and Radiological Science (B.-Y.H. ), China Medical University, Taichung, Taiwan. MATERIALS AND METHODS: We introduced a repetitive closed-head injury rodent model (n = 70) without parenchymal lesions. We performed a longitudinal MR imaging study during a 50-day study period (T2-weighted imaging, susceptibility-weighted imaging, and diffusion tensor imaging) as well as sequential behavioral assessment. Immunohistochemical staining for astrogliosis was examined in a subgroup of animals. Paired and independent t tests were used to evaluate the outcome change after injury and the cumulative effects of impact load, respectively. RESULTS: There was no gross morphologic evidence for head injury such as skull fracture, contusion, or hemorrhage on micro-CT and MR imaging. A significant decrease of white matter fractional anisotropy from day 21 on and an increase of gray matter fractional anisotropy from day 35 on were observed. Smaller mean cortical volume in the double-injury group was shown at day 50 compared with sham and single injury (P < .05). Behavioral deficits (P < .05) in neurologic outcome, balance, and locomotor activity were also aggravated after double injury. Histologic analysis showed astrogliosis 24 hours after injury, which persisted throughout the study period. CONCLUSIONS: There are measurable and dynamic changes in microstructure, cortical volume, behavior, and histopathology after both single and double injury, with more severe effects seen after double injury. This work bridges cross-sectional evidence from human subject and pathologic studies using animal models with a multi-time point, longitudinal research paradigm. Traumatic brain injury (TBI) is a major public health issue with increasing incidence and enormous cost to society worldwide.1,2 Mild TBI is generally imperceptible on conventional diagnostic imaging, yet it can be associated with widespread symptoms. In patients with mild TBI, quantitative MR imaging analysis assessing macrostructural and microstructural effects of injury has been extremely promising.3,4 Specifically, human subject studies suggest regional cortical volume loss5,6 and abnormal fractional anisotropy (FA) in white matter regions susceptible to traumatic axonal injury, such as the corpus callosum, internal and external capsules, and anterior and posterior corona radiata.4,7 More recently, multishell diffusion with biologic modeling suggests WM pathologic changes.8 However, due to the difficulties of performing multiple, rapid, serial imaging studies as well as the lack of histopathologic confirmation in human subjects with concussion, we still lack a clear understanding of the evolution of tissue injury across time. Furthermore, there is a specific, growing need to elucidate the effect of multiple head impacts/head injuries on short-term recovery and long-term outcome. The purpose of this work was to measure dynamic temporal changes of macrostructural and microstructural damage from the acute-to-chronic phase postinjury after both single and repetitive head injury using a well-controlled model of closed-head injury (CHI) without focal contusion/hemorrhage. We describe observed differences among animals after single injury, double injury, and sham surgery and report the behavioral and neuropathologic correlates of injury. The study was performed in accordance with the recommendations of National Institutes of Health Guidelines for Animal Research (Guide for the Care and Use of Laboratory Animals) and the Animal Research: Reporting In Vivo Experiments guidelines. The protocol was approved by the Institutional Animal Care and Use Committee at Taipei Medical University. Animals were randomly assigned to 3 groups (single, double CHI, and sham control) for longitudinal and cross-sectional assessment (On-line Fig 1). Seventy adult male Sprague-Dawley rats weighing 250–400 g (BioLASCO Taiwan Co, Taipei City, Taiwan) were anesthetized using chloral hydrate (400 mg/kg) and placed on a stereotaxic frame for an operation. All surgical procedures were performed under aseptic conditions. This CHI model modifies the protocol from the weight-drop injury model9 using the following: 1) fixed head positioning to achieve precise localization and force delivery, 2) addition of a secured impactor, and 3) alteration of the height of a freely dropped brass weight. Briefly, a midline incision was performed on the scalp, and a circular stainless steel helmet (10-mm diameter) was cemented over the skull on top of the left sensorimotor cortex (1.5 mm posterior and 2.5 mm lateral to the bregma). A 600-g weight was dropped from a height of 1 m through a stainless steel tube (1-m height with an inner diameter of 20 mm for clearing a column of stainless brass weights) to the secured impactor with a round tip aimed at the metal helmet. Animals in the double CHI group received 2 impacts with a 1-hour interval.10 The helmet was immediately removed after the last impact, and the scalp was sutured. Physiologic parameters, including heart rate and blood oxygen saturation level, were continuously monitored using a pulse oximeter (SurgiVet; Smiths Medical, Waukesha, Wisconsin). Rats were given topical antiseptics and lidocaine at the surgical site during the postoperative period. Micro-CT images were obtained on harvested skulls using a SkyScan 1176 scanner (Bruker BioSpin, Ettlingen, Germany) at an isotropic resolution of 9 μm and were visually assessed for subtle skull fractures by a neuroimaging expert. Longitudinal MR imaging was performed in each group before, at 24 hours, 7 days, 21 days, 35 days, and 50 days after CHI or sham surgery using a PharmaScan 7T system (Bruker BioSpin). Animals were anesthetized under ∼1.2% isoflurane, and the stereotaxic headpiece and holder, consisting of ear and tooth bars, were used to immobilize the head. Physiologic conditions, including heart rate, arterial pulse extension, oxygen saturation, and rectal temperature, were continually monitored and maintained within normal ranges throughout the experiment.11⇓–13 A volume coil was used for radiofrequency excitation, and an array coil was used for signal receiving. Initial localization scans were obtained, and T2-weighted images using a rapid acquisition with a relaxation enhancement sequence (TR/TE = 3600/40 ms, FOV = 2.0 × 2.0 cm, matrix size = 256 × 256, 16 slices, slice thickness = 1 mm) were obtained to acquire anatomic images for rodent models.11,13 Diffusion tensor images were acquired with the same geometry using the 4-shot spin-echo EPI with TR/TE = 3000/28 ms, matrix size = 96 × 96, δ/Δ = 5/15 ms, number of B0 = 5, number of directions = 30, b-value = 1000 s/mm2, number of averages = 4. Susceptibility-weighted images were obtained with the same geometry using the flow-compensated gradient-echo sequence with bandwidth = 30 kHz, TR/TE = 600/18 ms, matrix size = 256 × 256, flip angle = 40°, and number of averages = 6. T2-weighted imaging and SWI were visually inspected for brain deformation, tissue loss, edema, and the presence of hemorrhage by 1 attending neuroradiologist with >25 years of experience and 1 neuroimaging expert with 5 years of experience in rodent models. Image analysis, including skull stripping and motion correction/coregistration across time points and subjects, was performed using Statistical Parametric Mapping software (http://www.fil.ion.ucl.ac.uk/spm/software/spm12) and a custom Matlab (MathWorks, Natick, Massachusetts) script, published previously.11,12,14 To measure the cortical volume, we manually drew cortical ROIs and then applied them onto coregistered T2-weighted images. To better delineate the border between the cortex and WM, we applied a threshold of 2 SDs of the signal intensity of cortical ROIs. All threshold-defined results were visually inspected for gross errors by 2 experienced investigators blinded to the experimental groups. Parametric diffusion maps were generated for mean diffusivity (MD), axial diffusivity (AD), radial diffusivity (RD), and FA. Rectangular ROIs (5 × 2.5 mm2 per slice) were manually placed on FA maps on 3 consecutive slices subjacent to the impact region in the cortex, WM, and subcortical gray matter (Fig 1A). A threshold of FA > 0.35 was applied to extract WM.14 Cortical and subcortical tissue was segmented using a pixel-by-pixel classification based on spatial information relative to WM. Rectangular ROIs (1 × 1.5 mm2 per slice) were manually placed on FA maps on 3 consecutive slices (3–5 mm posterior to the bregma) covering the ipsilateral hippocampus. Mean MD, AD, RD, and FA values were calculated in the hippocampal ROIs and WM and cortical and subcortical tissue in the ROIs adjacent to the impact region. Longitudinal changes in FA after CHI. A, Automatically segmented ROIs deep to the site of impact on 3 consecutive slices show the cortex (green), white matter (red), and subcortical tissue (blue). Longitudinal follow-up during the first 50 days shows the evolution of mean FA values across time, which differ between white matter (B) and gray matter (C–E) structures, as well as important differences between single and double injury. Data are means; ‡ indicates P < .05 versus the sham; asterisk, P < .05 versus baseline (day 0 [D0]). Immunohistochemical staining of formalin-fixed, paraffin-embedded tissue sections was performed using the Immunoperoxidase Secondary Detection system kit (IHC Select, DAB500; Millipore, Temecula, California). Briefly, the slides were deparaffinized and treated with 3% H2O2 to block endogenous peroxidase activity. Citrate buffer was used for antigen retrieval at 90°C. Staining procedures were performed according to manufacturer's recommendation. Specimens were counterstained with hematoxylin and mounted with ProLong Gold Antifade reagent (P36930; ThermoFisher Scientific, Waltham, Massachusetts). To assess neuroinflammation, we used the following antibodies for immunohistochemical staining: anti-glial fibrillary acidic protein (GFAP) (ab68428; Abcam, Cambridge, Massachusetts) and anti-Cluster of Differentiation 68 (CD 68) (GTX41868; GeneTex, Irvine, California). Statistical analyses were performed using SPSS software (IBM, Armonk, New York). Significant differences in DTI metrics, cortical volume, and behavioral outcome between sham, single, and repetitive injuries across the entire study period were assessed using a 2-way mixed ANOVA. Significant differences in GFAP and CD 68 expression were assessed using 2-way ANOVA. Post hoc tests were performed by the Tukey honestly significant difference and the Dunnett T3 post hoc tests for data passing and not passing the homogeneity test, respectively. The significance level was set at P < .05. Inspection of T2-weighted imaging and SWI revealed no focal brain contusions or hemorrhage at both 24 hours and 50 days postinjury (Fig 2), and there were no fractures identified using micro-CT.
No focal hemorrhage or contusion on conventional MR imaging after experimental CHI. T2-weighted imaging and susceptibility-weighted imaging with in-plane resolution of 78 μm obtained at 7T on day 1 and day 50 after single (A) and double (B) CHI show no contusion, edema, or microhemorrhage. One representative animal from each group for the longitudinal study is shown here. There were no differences in mean baseline cortical volume among groups (520.169 ± 6.77, 516.88 ± 6.53, and 523.68 ± 10.48 mm3 for single injury, double injury, and sham groups, respectively). Longitudinal follow-up during 50 days revealed decreased cortical volume in the single- and double-injury groups (P < .01). Furthermore, animals in the double-injury group sustained a significantly larger percentage change in volume (0.11 ± 0.02 mm3) compared the single-injury group at 50 days follow-up (0.06 ± 0.02 mm3) (P < .01; Fig 3). Cortical loss after experimental CHI. There is a clear decrease in cortical volume as measured on T2-weighted images 50 days postinjury compared with baseline (A), with a greater percentage volume change after double injury (n = 12) compared with sham surgery (n = 9) and single injury (n = 12). Reduction of cortical volume is associated with the number of impacts. Data are means. ‡ indicates P < .05 versus the sham; #, P < .05 versus the single CHI; SMCx, sensorimotor cortex. Compared with baseline measurements, while there were no significant changes in MD after sham surgery or injury in all groups (On-line Table 1), significant changes in AD and RD after injury are shown in On-line Fig 2. There were differences in FA compared with baseline measures in the double-injury group but no change in FA with time in the sham and single-injury group (On-line Table 2). Namely, WM FA showed a significant decrease from the baseline value beginning at 21 days (P = .04) after double injury, which was sustained at 50 days. In the cortex, there was a significant increase in FA from baseline beginning at 35 days (P < .01) after double injury, sustained at 50 days. Subcortical FA showed a significant increase from baseline at 21 days (P = .02) after double injury. Hippocampal FA showed a significant increase from baseline at 35 days (P = .02; Fig 1) after double injury. While there were no differences in MD among groups, significant changes in cortical AD and cortical RD were found between single- and double-injury groups after 35 days (On-line Fig 2). Higher mean subcortical FA (P < .01) was observed in the single-injury group compared with the sham group beginning 35 days after injury. Similarly, FA was higher in the double-injury group compared with the sham group in the cortical (at 50 days), subcortical, and hippocampal (beginning at 35 days) regions. FA was lower in the double-injury group compared with the sham group in WM (beginning at 35 days) (P < .01; Fig 1). No other differences were seen among groups in terms of diffusion metrics. All groups (sham and single- and double-injury) demonstrated significantly increased mNSS 24 hours after ictus (from 1.50 ± 1.09 to 3.00 ± 1.48 for sham, from 2.67 ± 0.58 to 4.42 ± 2.07 for single injury, and from 3.00 ± 1.41 to 6.21 ± 2.75 for double injury; P < .03). mNSS in the sham and single-injury groups recovered after days 7 and 28, respectively; however, it continued to be elevated in the double-injury group for the entire study period (P < .02). Animals in the double-injury group demonstrated higher mean mNSS compared with the single-injury (P < .01) and the sham (P < .01) groups from 7 days on (Fig 4A). Behavioral deficits after CHI. mNSS (A) and beam-walking duration (B) after single and double CHI compared with sham surgery. In single-injury rodents, the mNSS score and beam-walking duration follow a similar time course compared with animals in the sham group; whereas in double-injury rodents, the mNSS score and beam-walking duration both increase significantly after CHI by day 7 and do not resolve by day 50. Locomotive activity as measured by movement duration (C) and travel distance (D) in the open-field trial after single and double CHI is impaired and persisted at day 50 after double injury. Data are means. ‡ indicates P < .05 versus the sham; asterisk, P < .05 versus baseline (day 0 [D0]); #, P < .05 versus the single CHI. Beam-walking duration was significantly increased over baseline (28.50 ± 2.90 seconds) beginning at 24 hours (65.90 ± 23.00 seconds; P < .01) following double injury and remained increased during the entire 50-day study period (155.30 ± 28.59 seconds; P = .02). Significantly higher average beam-walking duration was observed after double injury (118.00 ± 13.11 seconds) compared with single injury (26.00 ± 19.69 seconds; P < .01) after 7 days (Fig 4A, -B). There were no other significant differences in beam-walking duration scores. With regard to the open-field test, both single- and double-injury groups showed decreased movement duration compared with baseline, beginning at 24 hours after CHI (from 173.30 ± 22.00 to 86.67 ± 15.93 seconds for single injury; and from 141.92 ± 34.63 to 72.36 ± 21.18 seconds for double injury; P < .01). While movement duration in animals with single injury recovered after 14 days, movement duration in animals with double injury remained significantly lower compared with baseline for the entire 50-day period (77.27 ± 12.50 seconds; P < .01). Between-group differences were seen in movement duration between sham (161.67 ± 23.15 seconds) and single injury (102.34 ± 19.90 seconds; P < .01) as well as sham and double injury (85.17 ± 27.13 seconds; P < .01) from day 7 through 14. This difference persisted in the double-injury group (178.23 ± 46.69 versus 89.93 ± 12.73 seconds at day 50; P < .01), whereas the single-injury animals recovered movement duration scores in a manner more similar to sham animals beyond day 28. From day 28 on, there was also a significant difference between single (163.83 ± 37.31 seconds) and double (88.59 ± 11.45 seconds; P < .01) injury groups (Fig 4C). Travel distance was also measured from the open-field test and was decreased in all groups from baseline measures at 24 hours (from 2314.14 ± 657.09 to 1378.06 ± 224.62 cm for sham, from 2323.30 ± 342.68 to 1340.20 ± 286.26 cm for single injury, and from 2308.50 ± 479.38 to 906.61 ± 389.05 cm for double injury; P < .03). In sham animals, the mean travel distance recovered by day 7 after surgery. In animals with single and double injury, travel distance recovered by day 14 after injury. While differences in travel distance between sham and single-injury groups were seen only on day 7 after CHI, statistical differences between the double-injury and sham groups were consistently present from 24 hours through day 50 (P < .01). In addition, a difference in travel distance was also present between single- and double-injury groups initially at 24 hours (P = .02) (Fig 4D). To evaluate anxiety-like behavior, we measured center entries and center time from the open-field test (On-line Fig 3). Evidence for reactive gliosis was seen using GFAP and CD 68 immunohistologic staining in both the cortex and the CA1 region of the hippocampus after CHI (Fig 5A). GFAP immunoreactivity was observed in the cortex and hippocampus in both single- and double-injury animals compared with the sham animals at 24 hours and was sustained at 50 days (P < .05). Involvement of the hippocampus confirms that more diffuse histopathologic changes occurred remote from the direct site of impact. CD 68 expression was also observed in the cortex at 24 hours after double injury (P = .01) and increased at day 50 after single and double injury compared with sham injury (P < .02). 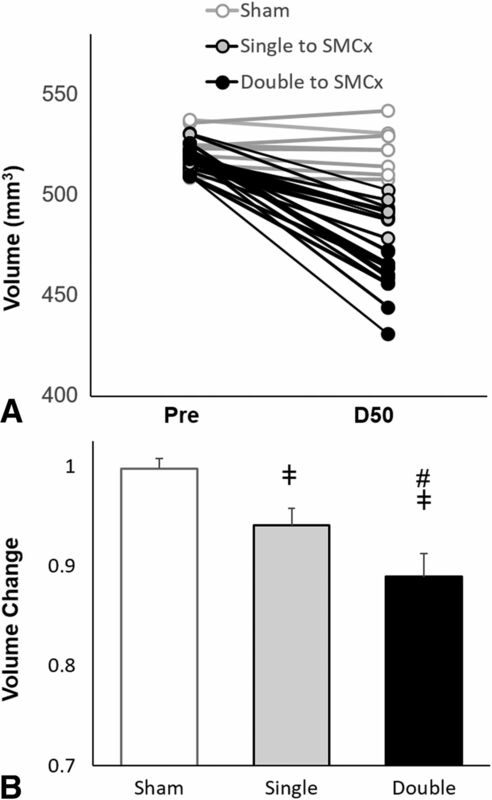 CD 68 expression in the hippocampus was prominent compared with the sham animals at 50 days after double injury (P < .02) (Fig 5B–E). Astroglial and microglial expression in the cortex and hippocampus underlying the impact region after CHI. A, GFAP-positive staining and quantification of GFAP expression in the cortex (B) and hippocampus (C) after CHI. D, CD 68–positive staining and quantification of CD 68 expression in the cortex (E) and hippocampus (F) after CHI. As early as 24 hours after both single and double CHI, elevated GFAP is observed in both the cortex and hippocampus deep to the impact site. CD 68 expression indicating neuroinflammation is also observed at 24 hours postinjury and sustained to day 50 in the cortex after double CHI. Scale bar, 40 μm. Here we introduce a modified weight-drop model with fixed head positioning to allow a high-degree of control over the strength and location of impact, improving reproducibility of the injury.20,21 Our results show this to be a reliable model to deliver experimental CHI without focal traumatic brain lesions, a challenge and limitation of many prior studies of head injury using rodent models.20⇓–22 This work provides the most comprehensive longitudinal study to date of single and double head injury using a reliable CHI model and seeks to fill in gaps in our knowledge regarding the temporal evolution of injury and recovery of the brain. We found significant macrostructural, microstructural MR imaging changes, behavioral changes, and histologic differences after injury in both single- and double-injury groups during the first 50 days after injury and describe these temporal changes. We found significant changes in cortical volume and FA from baseline after both single and double injury, with differences between the 2 groups suggesting that injury to the brain may be cumulative. Specifically, our results show decreased WM FA after 21 days in the double-injury group. This is in keeping with most human studies of mild TBI that showed decreased FA in WM after injury.28 Previous animal studies of head injury (with contusion) also showed significantly reduced FA in the WM within 1 week of injury, which investigators have related to diffuse axonal injury and loss of myelin.29⇓⇓–32 We also found increased GM FA after double CHI in cortical, subcortical, and hippocampal structures. Published evidence of FA changes in gray matter after brain injury is mixed.17,31,33 The mechanism behind increased GM FA in TBI models is incompletely understood, though some have suggested this to be reflective of inflammatory changes29,30,32 and the orientation of astrocyte processes34,35 associated with underlying injury. We did, in fact, observe astrogliosis on immunohistochemical staining in this study. Future work combining atlas-based tissue segmentation and interrogation of a greater number of regions, including those more remote from the injury, will better illustrate the dynamic changes in diffusion anisotropy. Limitations of the current study include the use of a fixed head position during impact, which, while advantageous to quantify the delivery of impact, lacks the linear translation and rotation common to clinical scenarios of mild TBI. Other animal models are, however, criticized for the inability to quantify and control rebound effects as well as the common occurrence of focal hemorrhage/contusion.21,22 We have work currently underway to establish a related setup using unrestrained animals to better model acceleration-deceleration influences on injury. Our results demonstrate that CHI-related alterations are augmented by the number of impacts, though we studied only 1 repetitive paradigm. Additional studies using varying impact regions and repetition schemes would optimally take advantage of a model such as the one proposed here. Last, in addition to neuroinflammation, changes in the neural density, axonal integrity, or abnormal protein accumulation may also contribute to alteration in DTI metrics.31,40 We plan to examine this possibility using respective immunohistochemical stains in our future studies. Our study describes a repetitive CHI model without acute macroscopic damage that leverages the benefits of controlling impact degree, location, and number. There are measurable neuroimaging abnormalities after CHI that evolve dynamically during the first 50 days postinjury, occurring after the immediate effects on behavior and neuropathology. There is a cumulative effect that the number of injuries has on later cortical atrophy, evolving microstructural changes, and neurobehavioral outcome in the first 50 days following injury. This work bridges predominantly cross-sectional evidence from human subject studies and pathologic studies using animal models with a rich, multi-time point, longitudinal research paradigm. Disclosures: Yu-Chieh Jill Kao—RELATED: Grant: Ministry of Science and Technology, Republic of China. Cheng-Yu Chen—RELATED: Grant: Ministry of Science and Technology, Republic of China. Comments: 3-year grant for animal model study. * Yvonne W. Lui—UNRELATED: Grants/Grants Pending: National Institutes of Health (R01 NS039135-11, R21 NS090349 and P41 EB017183)*; OTHER RELATIONSHIPS: Siemens-New York University collaboration lead and advisor for Bold Brain Ventures LP. *Money paid to the institution. This work was supported by the Ministry of Science and Technology, Taiwan (MOST105-2628-B-038-002-MY2, MOST104-2923-B-038-003-MY3, MOST106-2314-B-010-058-MY2, MOST105-2221-E-038-007-MY3 and MOST107-2314-B-038-005), Taipei Medical University (TMU103-AE1-B27), and Taipei Medical University Hospital (105TMUH-SP-01, GH107SP02). This work originated from Taipei Medical University (Address: 250 Wuxing St., Taipei 110, Taiwan). Accepted after revision February 16, 2019.